In the year 1900, hurricane detection technology like Doppler radars, computer models, and hurricane hunter air planes did not exist. Due to this, hurricanes were, for the most part, a total surprise when they made landfall. It starts as some heavy rains the day before landfall. Quickly, this turns into intense winds and flooding that can entirely decimate property and end countless lives. Enter Galveston, Texas, September 7th, 1900. Unbeknownst to most the residents, an incredibly powerful hurricane spun at an incredible 130 mph just off of the coast of their city. The Weather Bureau reported that a storm had hammered the Caribbean and seemed to be headed in the direction of Texas. Many people in Galveston were unaware that a hurricane was headed in their direction. Many of the people that were aware didn’t heed the warnings of The Weather Bureau. These people instead opted to view the show that the hurricane would provide once it made landfall. Those that opted to stay in Galveston were in for a little more than a show. 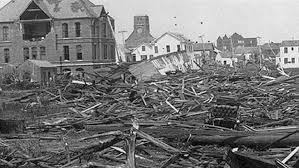 When the Hurricane made landfall on September 8th, 1900, it devastated the entire city. A storm surge that got as high as 15 feet severely flooded the island as well as the majority of the Texas coast. Many people escaped the storm surge, but by the time the storm passed over Galveston, an estimated 12,000 people had lost their lives. Contrary to popular belief, the wind and heavy rains aren’t the most dangerous aspects of a hurricane. People that live in a hurricane zone should be prepared year round for all dangers that hurricanes present – and storm surge is no exception. 88% of hurricane-related deaths in the U.S is the result of storm surge. Storm surge forms as hurricanes travel over warm waters. This allows the storm to absorb moisture and heat from the water, which strengthens the hurricane. Storm surges can be thought of as a wall of water that will inevitably make it to shore. This wall of water can be massive – in the case of 2005’s Hurricane Katrina – 28 feet high in parts of Gulfport, Mississippi. When a hurricane brings along storm surge as it makes landfall it seems like the ocean has come onto land — sometimes as far as 2 miles inland. Storm surge is an incredibly destructive force – but it is possible to protect your property from the dangers that storm surge can present. Water has the ability to travel wherever it pleases. When storm surge threatens an area, there really isn’t much that can be done to negate this powerful force of nature. One of the few options that property owners have to try and defend their home from the potential damage that storm surge can cause is protecting the foundation of the home with sandbags. Sandbags around the Foundation will ensure that the building isn’t ripped from the foundation and swept away in the force of the storm surge. Covering vents with sandbags guarantees that no water makes its way into the property. Being prepared is the number one way to minimize loss of life in the event of severe storm surge. Being prepared for storm surge means knowing if you live in a storm-surge prone area or not. Also, how to contact your family members, and how to evacuate. Before a hurricane makes landfall, take an inventory all of your property. This will allow you to see what you’ve lost during the storm – for both personal, and insurance reasons. To keep your family safe, you should create an emergency supply kit. This includes extra clothing for all family members, battery-powered radios, flashlights, batteries, canned food, and 1 gallon of water per person, per day. To learn more about the emergency supply kit, check out this post from the Restoration USA blog. Real estate and restoration experts alike will tell you the best way to protect your home from storm surge is to purchase flood insurance. Usually, homeowner’s insurance policies do not cover flooding caused by storm surges. Truth be told, there isn’t much you can do when storm surge threatens your property. If you’re in an area that is prone to inundation by storm surge, then evacuation is your best option. Remember: your property and belongings can be replaced; the lives of your loved ones cannot.